Captain E R Goulding, 9th Georgia Infantry, Company E, was appointed colonel, 9th Georgia Infantry, at Walton Springs, east of the Western & Atlantic Railroad, Atlanta, Fulton County, Georgia, on 15 June, 1861, dated 11 June, 1861. Captain R A Turnipseed, 9th Georgia Infantry, Company D, was appointed lieutenant colonel, 9th Georgia Infantry, at Walton Springs, east of the Western & Atlantic Railroad, Atlanta, Fulton County, Georgia, on 15 June, 1861, dated 11 June, 1861. Captain J C Mounger, 9th Georgia Infantry, Company H, was appointed major, 9th Georgia Infantry, at Walton Springs, east of the Western & Atlantic Railroad, Atlanta, Fulton County, Georgia, on 15 June, 1861, dated 11 June, 1861. The company was accepted in state service at Washington, Wilkes County, Georgia, on 11 June, 1861, and was ordered to proceed by the Georgia Railroad to Atlanta, Fulton County, Georgia, on 13 June, 1861. The company was designated the Irvin Artillery, under the command of Captain J Lane, by Special Orders No.508, Headquarters, Army of the Potomac, Camp Pickens, Manassas Junction, Prince William County, Virginia, on 12 December, 1861, and was assigned to the Reserve Artillery, Army of the Potomac, under the command of Colonel W N Pendleton, artillery, Confederate States Army, on 13 December, 1861. The company was assigned to the 11th Georgia Battalion Artillery, Company E, by Special Orders No.118, Adjutant & Inspectors General's Office, Richmond, Henrico County, Virginia, on 23 May, 1862 (See the Sumter Flying Artillery). The company was accepted in state service at Summerville, Chattooga County, Georgia, on 12 June, 1861, dated 11 June, 1861. The company was accepted in state service at Monroe, Walton County, Georgia, on 13 June, 1861, dated 11 June, 1861. The company was stationed at Fort Gaines, Clay County, Georgia, under the command of Captain R A Turnipseed, on 25 May, 1861, and was accepted in state service at Fort Gaines, Clay County, Georgia, on 11 June, 1861. The company was ordered to Atlanta, Fulton County, Georgia, the same day and Captain R A Turnipseed and First Lieutenant J G Webb, 9th Georgia Infantry, Company D, were appointed lieutenant colonel, 9th Georgia Infantry, and captain, 9th Georgia Infantry, Company D, at Walton Springs, east of the Western & Atlantic Railroad, Atlanta, Fulton County, Georgia, on 15 June, 1861, dated 11 June, 1861. The company was accepted in state service at Geneva, Talbot County, Georgia, on 11 June, 1861, and Captain E R Goulding and First Lieutenant P A S Morris, 9th Georgia Infantry, Company E, were appointed colonel, 9th Georgia Infantry, and captain, 9th Georgia Infantry, Company E, at Walton Springs, east of the Western & Atlantic Railroad, Atlanta, Fulton County, Georgia, on 15 June, 1861, dated 11 June, 1861. The company was accepted in state service at Milledgeville, Baldwin County, Georgia, on 11 June, 1861, and was stationed at Atlanta, Fulton County, Georgia, on 15 June, 1861. The company was stationed at Richmond, Henrico County, Virginia, on 21 June, 1861. The company was accepted in state service at Lafayette, Walker County, Georgia, on 12 June, 1861, dated 11 June, 1861, and Captain G G Gordon, 9th Georgia Infantry, Company G, was appointed surgeon, 9th Georgia Infantry, on 10 August, 1861. His resignation was accepted by Special Orders No.133, Paragraph XVII, Adjutant & Inspectors General's Office, Richmond, Henrico County, Virginia, on 24 August, 1861, and Second Lieutenant F F Hoge, 9th Georgia Infantry, Company G, was appointed captain, 9th Georgia Infantry, Company G, on 28 August, 1861. The company was accepted in state at Quitman, Brooks County, Georgia, under the command of Captain J C Mounger, on 9 June, 1861, dated 11 June, 1861, and was ordered to Atlanta, Fulton County, Georgia, on 10 June, 1861. Captain J C Mounger, 9th Georgia Infantry, Company H, was appointed major, 9th Georgia Infantry, at Atlanta, Fulton County, Georgia, on 15 June, 1861, dated 11 June, 1861, and the company was at stationed at Richmond, Henrico County, Virginia, on 26 June, 1861. The company was organised at Bulloch County, Georgia, on 24 May, 1861, and was accepted in state service on 10 June, 1861, dated 11 June, 1861. The company was accepted in state service at Americus, Sumter County, Georgia, on 11 June, 1861, and arrived at Richmond, Henrico County, Virginia, on 22 June, 1861. "The Troop Artillery of this city have changed their name to the 'Baldwin Volunteers.'" "The Company forming a part of the 9th Regiment which redezvoused at Atlanta, on the 13th inst., left our city on Wednesday last. They were escorted to the depot at 6 o'clock A. M. by the Governor's Horse Guards, Lieut. White in command, and the Baldwin Blues, Junior, Capt. Chas. A. Conn.'"
"To assemble in Atlanta 14th June, 1861: 1 Talbot Guards, Capt, E. Goulding, Geneva. 2. Brooks Rifles, Capt. Mounger, Quitman. 3. Fort Gaines Guards, Capt. Turnipseed, Fort Gaines. 4. Irvin Guards, Capt. G. G. Norman, Washington, Wilkes county. 5. Toombs Guards, Capt. L. C. Belt, Screven county. 6. Chattooga Volunteers, Capt. Echols, Rome. 7. Walton Guards, Capt. Geo. Hillyer, Walton. 8. Americus Vol. Rifles, Capt. J. M. D. King, Americus. 9. LaFayette Volunteers, Capt. G. G. Gordon, Lafayette. 10. Baldwin Volunteers, Capt. B. Beck, Milledgeville." "The following companies arrived here yesterday (Sunday) morning, and left on the evening train: Irvin Guards, Capt. G. G. Norman, from Wilkes county. 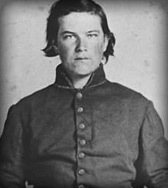 Calhoun Rifles, Capt. Wm. L. Furlow, from Gordon county. LaFayette Volunteers, Capt. G. G. Norman, form LaFayette county. The following companies passed through Augusta Monday morning: Hillyer Rifles, Capt. Geo. Hillyer. Toombs Guards, Capt. L. C. Belt, from Bullock county." "Two more companies belonging to the Ninth Regiment Georgia Volunteers, passed through this city this morning - the 'Brooks Rifles,' Capt. R. A. Hardee, and the Chattooga Volunteers, 1st Lieut. W. E. Cleghorn." "The following gentlemen were, on yesterday, says the Atlanta Confederacy of the 16th, elected officers of the Ninth Regiment of Georgia Volunteers: Colonel - Captain Goulding, of Talbot, Lieut. Colonel - Captain Turnipseed, of Clay, Major - Captain Mounger, of Brooks. The Regiment is now completely organised, the 'mustering in' having been completed yesterday. Four of the companies left last night for Richmond by the Georgia Road and two by the State Road. Two more leaves tonight." "Was mustered into service at Atlanta, Saturday. The officers are Capt. Goulding, of Talbot, Colonel; Capt. Turnipseed, of Clay, Lieut. Colonel; Capt. Mounger, of Brooks, Major. Four companies left for Richmond Saurday night by the Georgia Road and two by the State Road. Two more Companies left Sunday night." "About 500 more troops arrived here yesterday morning from Georgia. Besides several detachments for companies already here, there arrived the - Irvin Guards - Capt. G. G. Norman, 97 men, Lafayette Volunteers - Capt. G. G. Gordon, 84 men, Calhoun Rifles - Capt. Wm. L. Furlow, 116 men. And a detachment of 110 men belonging to the 9th Georgia Regiment, under the command of Captain George Hillyer." "On the 10th Inst., the Brooks Rifles left Quitman for the rendezvous of the 9th Regiment." "The Ninth Regiment of Georgia Volunteers, embracing nine companies and nine hundred men, arrived yesterday, and were mustered into the service of the Confederate States on Capital Square. The Regiment is to be joined by another company now on its way here, as was understood by inquiries made by some of the men." "The Baldwin Volunteers left Atlanta for this place June 16th, via East Tennessee." "We arrived in Lynchburg the third day from Atlanta. We encamped on the heights twenty-four hours." "From there, it was ordered to Manassas Junction, arriving there the same day as the Sumter Flying Artillery Battery. They, too, had missed the first great battle of the war." "It arrived after a much faster run than the one to Manassas - this time it carried no load - and was ready for Bartow's Second Brigade men to start boarding the cars by sundown. He got the 7th amd 8th Georgia Regiments aboard but did not have room to mount the rest of the brigade, which left the 9th Georgia and the 1st Kentucky stranded for the time being." The 9th Georgia Infantry was accepted in state service on 11 June, 1861, and was ordered to rendezvous at Atlanta, Fulton County, Georgia, on 14 June, 1861. The regiment was mustered in state service for the war at Walton Springs, east of the Western & Atlantic Railroad, Atlanta, Fulton County, Georgia, on 15 June, 1861, dated 11 June, 1861. Camp Brown, old Smyrna Camp Meeting Ground, on the Western & Atlantic Railroad, four miles south of Marietta, Cobb County, Georgia, Company C, 23 April-9 May, 1861: The Hillyer or Walton Rifles/Guards, Georgia Militia Battalion Cavalry, under the command of Captain G Hillyer, was stationed at Camp Brown, old Smyrna Camp Meeting Ground, on the Western & Atlantic Railroad, four miles south of Marietta, Cobb County, Georgia, between 23 April and 9 May, 1861. Note: The 9th Georgia Infantry, Company H, was accepted in state service on 9 June, 1861, dated 11 June, 1861; Company I on 10 June, 1861, dated 11 June, 1861; Companies A, D, E, F, and K on 11 June, 1861; Companies B and G on 12 June, 1861, dated 11 June, 1861; and Company C on 13 June, 1861, dated 11 June, 1861. Quitman, Brooks County, to Atlanta, Fulton County, Georgia, Company H, 10-12 June, 1861: The Brooks Rifles was ordered to Atlanta, Fulton County, Georgia, on 10 June, 1861, and arrived on 12 June, 1861. Walton Springs, east of the Western & Atlantic Railroad, Atlanta, Fulton County, Georgia, to Wilmington, New Hanover County, North Carolina, Companies A & G, 15-16 June, 1861: The 9th Georgia Infantry, Companies A (97) and G (84), were ordered to proceed by the Georgia Railroad to Richmond, Henrico County, Virginia, in the evening on 15 June, 1861, and were accompanied by the 12th Georgia Infantry (116), Company D, under the command of Captain W L Finlow. Companies A and G arrived at Augusta, Richmond County, Georgia, in the morning on 16 June, 1861, and were ordered to proceed by the South Carolina Railroad to Wilmington, New Hanover County, North Carolina, in the evening the same day. Note: Two companies of the 9th Georgia Infantry were ordered to proceed by the Western & Atlantic Railroad to Richmond, Henrico County, Virginia, in the evening on 15 June, 1861. Walton Springs, east of the Western & Atlantic Railroad, Atlanta, Fulton County, to Augusta, Richmond County, Georgia, Companies C & I, 16-17 June, 1861: The 9th Georgia Infantry (110), Companies C and I, under the command of Captain G Hillyer, Company C, were ordered to proceed by the Georgia Railroad to Richmond, Henrico County, Virginia, in the evening on 16 June, 1861, and arrived at Augusta, Richmond County, Georgia, in the morning on 17 June, 1861. Walton Springs, east of the Western & Atlantic Railroad, Atlanta, Fulton County, Georgia, to Richmond, Henrico County, Virginia, Company F, 16-19 June, 1861: The 9th Georgia Infantry (71), Company F, was ordered to proceed by the Western & Atlantic Railroad to Richmond, Henrico County, Virginia, in the evening on 16 June, 1861, and arrived by the Virginia & Tennessee Railroad at Lynchburg, Campbell County, Virginia, via Dalton, Whitefield County, Georgia, and Bristol, Sullivan County, Tennessee, on 18 June, 1861. The company was stationed at the Agricultural & Mechanics' Society Fairgrounds, on Fifth Street, three quarters of a mile southwest of Lynchburg, Campbell County, Virginia, between 18 and 19 June, 1861, and was ordered to proceed by the Southside Railroad to Richmond, Henrico County, Virginia, on 19 June, 1861. Note: The 9th Georgia Infantry, Company F, was stationed at Richmond, Henrico County, Virginia, on 24 June, 1861. Walton Springs, east of the Western & Atlantic Railroad, Atlanta, Fulton County, to Augusta, Richmond County, Georgia, Companies B & H, 18 June, 1861: The 9th Georgia Infantry, Companies B and H, were ordered to proceed by the Georgia Railroad to Richmond, Henrico County, Virginia, in the evening on 17 June, 1861, and arrived at Augusta, Richmond County, Georgia, in the morning on 18 June, 1861. Petersburg, Dinwiddie County, Virginia, Companies A, C, G, & I, 19 June, 1861: The 9th Georgia Infantry, Companies A, C, G, and I, arrived by the Weldon Railroad at Petersburg, Dinwiddie County, Virginia, in the morning on 19 June, 1861. Mustered for the war, Capital Square, on Capitol Hill, Richmond, Henrico County, Virginia, 25 June, 1861: The 9th Georgia Infantry was mustered in Confederate service for the war at Capital Square, on Capitol Hill, Richmond, Henrico County, Virginia, by Captain T H Taylor, cavalry, Confederate States Army, on 25 June, 1861 (See the 1st Kentucky Infantry). Note: The 9th Georgia Infantry, Companies E (68) and K (71), were stationed at Richmond, Henrico County, Virginia, between 22 and 25 June, 1861; Company F (73), between 23 and 27 June, 1861; Company G (80) between 24 and 25 June, 1861; Companies A (80) and C (60) between 24 and 26 June, 1861; and Company H (83) between 26 and 30 June, 1861. Richmond, Henrico County, to Winchester, Frederick County, Virginia, 26-28 June, 1861: The 9th Georgia Infantry was ordered to proceed by the Virginia Central Railroad to Winchester, Frederick County, Virginia, by Special Orders No.78, Paragraph XIII, Adjutant & Inspectors General's Office, Richmond, Henrico County, Virginia, in the afternoon on 26 June, 1861, dated 22 June, 1861, and arrived by the Orange & Alexandria Railroad at Manassas Junction, Prince William County, Virginia, at 11 PM the same day. The regiment was ordered to proceed by the Manassas Gap Railroad to Strasburg, Shenandoah County, Virginia, in the morning on 27 June, 1861, and arrived at 6 PM the same day. The 9th Georgia Infantry was ordered to proceed by the Valley Turnpike to Winchester, Frederick County, Virginia, in the morning on 28 June, 1861, and arrived the same day. Winchester to Hollingsworth Grove, east of the Millwood Turnpike, one mile southeast of Winchester, Frederick County, Virginia, 30 June, 1861: The 9th Georgia Infantry was ordered to Hollingsworth Grove, east of the Millwood Turnpike, one mile southeast of Winchester, Frederick County, Virginia, on 30 June, 1861. Note: The 9th Georgia Infantry was assigned to the Second Brigade, Army of the Shenandoah, under the command of Colonel F S Bartow, 8th Georgia Infantry, at Hollingsworth Grove, east of the Millwood Turnpike, one mile southeast of Winchester, Frederick County, Virginia, on 30 June, 1861. Hollingsworth Grove, east of the Millwood Turnpike, one mile southeast of Winchester, Frederick County, to Darkesville, Berkeley County, Virginia, 2-7 July, 1861: The 9th Georgia Infantry was ordered to proceed by the Marinsburg Turnpike to Darkesville, Berkeley County, Virginia, in the evening on 2 July, 1861, and arrived via Bunker Hill, Berkeley County, Virginia, at 10 AM on 3 July, 1861. Darkesville, Berkeley County, to Hollingsworth Grove, one mile southeast of Winchester, Frederick County, Virginia, 2-3 July, 1861: The 9th Georgia Infantry was ordered to Winchester, Frederick County, Virginia, at 11 AM on 7 July, 1861, and arrived at Hollingsworth Grove, east of the Millwood Turnpike, one mile southeast of Winchester, Frederick County, Virginia, at 6 PM the same day. The 9th Georgia Infantry was ordered to Manassas Junction, Prince William County, Virginia, by Special Orders No.1, Headquarters, Army of the Shenandoah, Winchester, Frederick County, Virginia, at 1 AM on 18 July, 1861, dated 17 July, 1861. Hollingsworth Grove, east of the Millwood Turnpike, one mile southeast of Winchester, Frederick County, to Piedmont Station, Fauquier County, Virginia, 18-19 July, 1861: The 9th Georgia Infantry was ordered to proceed by the Millwood Turnpike to Piedmont Station, Fauquier County, Virginia, at 1 PM on 18 July, 1861, and arrived at Berry's Ferry, on the Shenandoah River, via Millwood, Clarke County, Virginia, at 9 PM the same day. The regiment was ordered across the Shenandoah River at Berry's Ferry, three and a half miles southeast of Millwood, Clarke County, Virginia, in the evening on 18 July, 1861, and arrived at Paris, Fauquier County, Virginia, via Ashby's Gap at 3 AM on 19 July, 1861. The 9th Georgia Infantry was ordered to Piedmont Station, Fauquier County, Virginia, at 5 AM the same day and arrived at 11 AM on 19 July, 1861. Piedmont Station, Fauquier County, to Manassas Junction, Prince Willian County, Virginia, 22 July, 1861: The 9th Georgia Infantry was ordered to proceed by the Manassas Gap Railroad to Manassas Junction, Prince Willian County, Virginia, in the morning on 22 July, 1861, and arrived at Camp Pickens, Manassas Junction, Prince Willian County, Virginia, in the afternoon the same day. The 9th Georgia Infantry was stationed at Camp Victory, in the vicinity of the F Lewis' Farm, a quarter of a mile southwest of Lewis' Ford, on the Bull Run River, between 22 and 31 July, 1861. Camp Victory, in the vicinity of the F Lewis' Farm, a quarter of a mile southwest of Lewis' Ford,on the Bull Run River, to Smith's Farm, four miles northeast of Manassas Junction, Prince William County, Virginia, 31 July, 1861: The 9th Georgia Infantry arrived at Camp Bartow, Smith's Farm, four miles northeast of Manassas Junction, Prince William County, Virginia, on 31 July, 1861. Note: The 9th Georgia Infantry was stationed at Camp Bartow, Smith's Farm, four miles northeast of Manassas Junction, Prince William County, Virginia, between 15 August and 11 September, 1861. Surrendered at Appomattox Courthouse, Appomattox County, Virginia, 9 April, 1865: The 9th Georgia Infantry, under the command of Major J W Arnold, surrendered at Appomattox Courthouse, Appomattox County, Virginia, on 9 April, 1865. Second Corps, Army of the Potomac, 25 September, 1861: Major General G W Smith, Confederate States Army, was assigned to the command of the Second Corps, Army of the Potomac, by General Orders No.31, Headquarters, Army of the Potomac, Camp Pickens, Manassas Junction, Prince Willian County, Virginia, on 25 September, 1861. The 9th Georgia Infantry was assigned to the Second Brigade, Second Corps, Army of the Potomac, under the command of Brigadier General S A M Jones, Confederate States Army, on 25 September, 1861.